I know all of you have been at this game for quite some time. I know you’ve seen all the system ‘pitches’, the touts who promise to make you a millionaire, the ‘miracle’ sliderulers, etc., etc. I also know, as an average everyday player like most of you are, that I have been tempted to the point of purchasing many of these goofy systems and such, only to be profoundly disappointed once I started using them. That’s why I went ‘cold turkey’ in the late 1980’s on these pie-in-the-sky promises and started developing workable systems on my own. My first big success was The Sound System (the ‘sound’ meaning the system was based on ‘sound’ handicapping factors and values). I know many of you own The Sound System, a method which is now also on software. 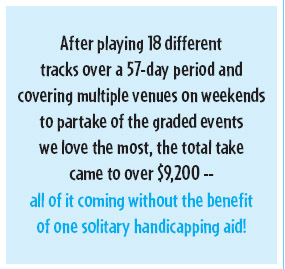 The Sound System continues to crank out profits for its users and received one of the highest ratings ever given from Phillips Racing Newsletter. You may also be familiar with my Works of Cash, II and 3-D System, both of which have become best-sellers and have served me well over the years. And while I’m proud to claim to be one of the ‘winners’ in this game, using my methods to produce a nice supplemental income, I nevertheless am always searching for the real ‘magic bullet’, so to speak. You see, I just turned 60, and as the years have flown by I’ve found I want more time to enjoy my remaining time on this planet — traveling, eating out more often, etc., — which means I would have less time for handicapping. But since my handicapping has made me some nice $$$, quitting was out of the question. But as I was pondering my dilemma, a very interesting thing happened. In a nutshell, friend James implored me to give him a no-brainer that didn’t require any handicapping and produced some action and nice profits — a tall order, to say the least. Never one to turn down a challenge and, given the significant input that earned James co-authorship, we went to work tackling the problem. Amazingly, the result of our partnership created exactly what we wanted, and believe it or not, we had it down on paper in less than two weeks! Needless to say, we were excited! In our younger days attending the three main Southern California emporiums, we tried any number of handicapping ideas but toteboard watching was never one of them, the main reason being one of timing. During the week you could wait until a couple minutes before post and not get shut out at the window but weekends were nearly always packed and one couldn’t afford the luxury of waiting until the last few minutes before the gate sprung open. Whatever horse we settled on often had to be bet well before the race was run. Just as often we found ourselves stuck with final odds way below what we wanted on a horse otherwise not worth a bet. We were hardly disciplined back in those days and that surely had a hand in my eventual evolvement into a system writer. 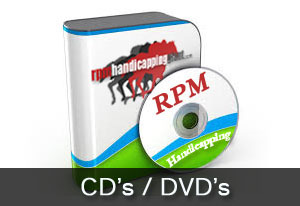 But, more to the point, timing as a segment of the handicapping equation is no longer an issue with high-speed computer systems and on-line race books now at our fingertips. All the nutty toteboard methods and ideas we came across over the years never amounted to anything worthwhile but many customers of my deeper (ahem) methods chimed in with the refrain of wanting it simple, simple, simple. So friend James caught me at just the right time to put an idea like this together that DID do the job. PPS COMPILED AN ASTONISHINGLY CONSISTENT ARRAY OF PAYDAYS ALONG WITH SOME EQUALLY EYE-CATCHING MUTUELS IN OUR EXTENSIVE WORKOUT. 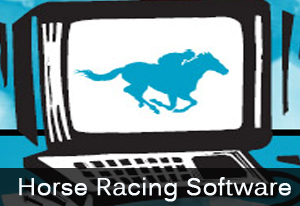 go to the window at your favorite track or racebook or click on the horse’s number on the web. 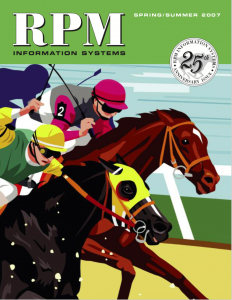 In fact, while the results won’t be quite as good but still nicely profitable, I will show you an alternate way of making your bets early and heading home, so you don’t need to hang around the racetrack/racebook. How’s that for the ‘good life’! This is a toteboard system utilizing the morning line odds as a starting point. 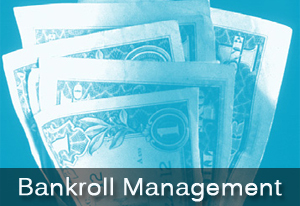 The formula requires no handicapping whatsoever and it takes only moments to determine your selections. 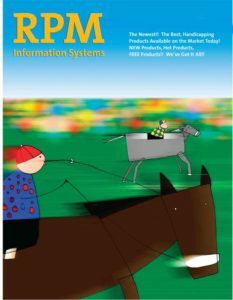 While designed specifically for thoroughbred racing, we’ve also had success with harness and quarter horses. What could be simpler? profit/loss per race card which is included in the actual system. You will receive the full 8-page, 57-day workout and you will see just how consistently profitable this method is. $9,200!! 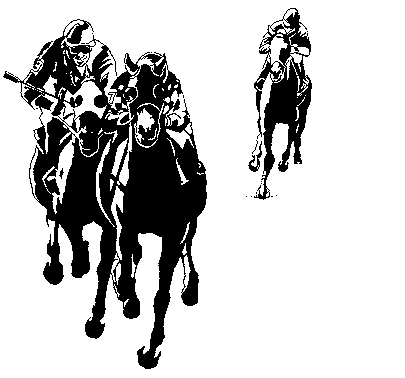 — all of it coming without the benefit of one solitary handicapping aid! Our figures came from $20 win/place/show wagers and $2 Exactas. Even when we ventured into unfamiliar territory such as Harrington Raceway or During the course of the workout, PPS nailed win streaks of four on six occasions, five in a row four times and a six-bagger once. On the negative side came one losing run of six and three bad sets of four. However, not a single page (the average ‘page’ contains about 15 days worth of results) of results in our workout put us in the minus column — that means you will be profiting the vast majority of the time. With six being the worst runout, even a very conservative player can handle that! On the subject of Exactas, if you’re a novice or unfamiliar with all the myriad offerings the tracks overwhelm you with, give our Exotics Wagering Guide a browse. It’s FREE when you purchase Playday Payday, and you will find it an extremely cagey strategy to nail exotic payoffs. Here are the EXACTA BOMBS PPS scored: 14 paying at least $100 . . . 7 paying at least $200 . . . 2 paying at least $300 . . . and 4 paying $516.20, $540.60, $574.60 and $776.40! prices much higher than the 33% norm with favorites. The Return On Investment (ROI) numbers above are extraordinary when taking all of this into account. And a positive return of six percent on show bets, are you kidding me? Almost a four dollar average on one of the worst plays you can make? I must be dreaming! types of plays sparingly until you have some of the track’s money, which you should after using PPS just a couple of days. The important thing is to do only what you can afford and you will come out ahead by keeping your wagering steady, win or lose. It took me almost 30 years to learn that lesson and it has served me so very well, so I speak from experience! Now I’m not going to let Playday Payday go for a song. The fact that it WILL make you money, probably the easiest money you’ve ever made. Remember, there is NO HANDICAPPING INVOLVED. You will simply be using the morning line to make your selections. Can it get any easier? In one word: NO! results, and he was playing Turf Paradise, known as the ‘graveyard of systems’. Nothing seems to work there, but PPS does! And Dave was kind enough to write the introduction letter for PPS. And while RPM is doing the selling part for me, I asked that they forego their usual restocking fee, so you have absolutely nothing to lose. Try PPS for a couple of weeks. If you don’t like it, send it back. And while I said I wasn’t letting it go for a song, I’m not charging an arm and a leg, either. In fact I think the $60 price Dave and I settled on is more than fair, especially since you should have that total back and then some quickly once you start using PPS. “Good judgment comes from experience and a lot of that comes from bad judgment,” and . . .
P.S. Your Playday Payday System will be in the mail within 24 hours, often even quicker!